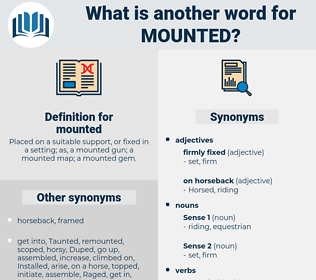 What is another word for mounted? 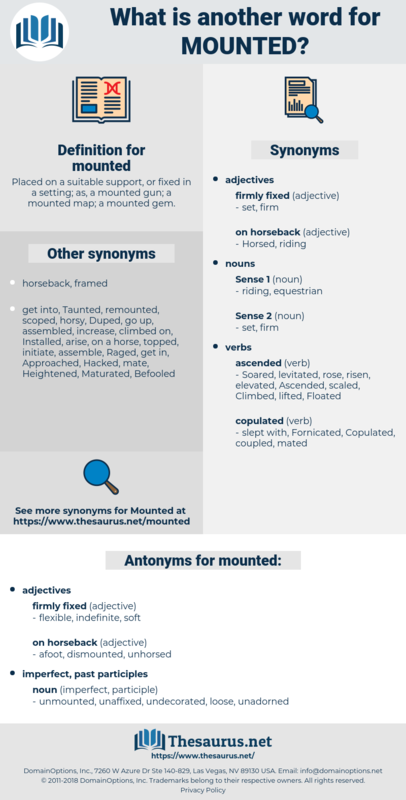 Placed on a suitable support, or fixed in a setting; as, a mounted gun; a mounted map; a mounted gem. Amounted, implemented, Undertook, mt, escalation, unfold, unfolded, conducted, orchestrated, Mobilized, moved, commissioned, Underwent, Commenced, Introduced, initiated, unleashed, determined, presented, outlined, action, Launched, co-organized, Submitted, Instituted, Instigated, topped, executed, established, escalate, intensified, Containing, escalated, Convened, Ascended, Ran, Performed, relocated, forthwith, Pioneered, Surpassed, arranged, structured, Cooperated, Came, Jumped, rose, apprehended, opened, sponsored, Issued, Stipulated, facilitated, Caught, bothered, Hiked, assaulted, founded, qualified, spearheaded, Embarked, Emerged, identified, Proceeded, stoked, sat, upgraded, Boosted, deepened, engaged, Surfaced, Grew, Began, advanced, co-hosted, practised, landed, Billowed, prepared, Threw, noon, HIT, adopted, Floated, pursued, Followed, zone, handled, scheduled, Gazetted, built, staged, Surged, Attacked, Stood, Appeared, settled, Challenged, Sued, Created, showed, tabled, formed, edited, defined, laid, Exceeded, decided, specified, rolled, directed, held, Boarded, Soared, Walked, posted, released, started, Assessed, Resulted, Visited, Arose, Depended, warmed, Stepped, wages, Waged, pressed, Went, cast, Carried, affixed, Rode, loaded, Fought, placed, Raided, Lasted, planned, fired, fixed, Raced, led, effected, rigged, won, stabbed, kicked, Took, Did, Got, Installed, Fitted, assembled. implemented, documented, Undertaken, Communicated, Encountered, unfolded, pronounced, conducted, oriented, landscaped, Constructed, Mobilized, compounded, Administered, Accentuated, moved, Undergone, commissioned, promulgated, Commenced, naturalised, Introduced, Disseminated, incorporated, interconnected, Inaugurated, initiated, unleashed, determined, presented, outlined, formulated, immobilized, Grounded, stabilized, bestowed, launch, entrenched, completed, co-sponsored, Accommodated, Organizing, Existed, Generated, action, maintained, Launched, co-organized, Submitted, Inflicted, Instituted, Compiled, entrusted, sounded, Managed, exacerbated, Stationed, established, Operated, intensified, positioned, accomplished, articulated, reinforced, Quoted, worsened, reinstalled, aggravated, routed, hung, Hanged, finalized, calculated, mandated, escalated, Convened, Ascended, Sited, triggered, connected, distributed, Performed, relocated, planted, endowed, sequestered, designated, Deployed, publicized, circulated, Inserted, compressed, run, activated, arranged, structured, fastened, Cooperated, Promoted, situated, adjusted, opening, enclosed, reopened, opened, sponsored, located, allotted, spotted, Issued, Stipulated, facilitated, associated, downloaded, Caught, co-located, disclosed, produced, elaborated, founded, Emplaced, spearheaded, prescribed, Embarked, Emerged, Tendered, identified, assigned, invested, Proceeded, broadcast, broadcasted, Detained, permitted, maximized, classified, grown, curated, uploaded, advertised, Begun, upgraded, Amplified, engaged, Filed, Anchored, Devised, enhanced, highlighted, stretched, emphasized, Protested, contracted, expanded, co-hosted, practised, thrown, fostered, confined, misplaced, landed, intended, disposed, Erected, Propelled, divided, Remanded, prepared, inclined, solicited, fixated, secured, grouped, opposed, adopted, reversed, embedded, attached, Supplied, pursued, Followed, coupled, Entailed, scheduled, designed, Engineered, Migrated, armed, built, rooted, risen, Adduced, faced, Surged, pinned, Drafted, scattered, Lodged, booked, Widened, Exerted, adapted, used, settled, Challenged, framework, Displayed, chosen, Levelled, Evolved, lifted, equipped, Viewed, Created, stored, Piloted, joined, tabled, formed, edited, Been, dictated, Hinged, posed, struck, defined, packaged, laid, decided, specified, rolled, Hurled, Provided, lowered, Referred, staffed, held, Boarded, Soared, Pushed, posted, vested, released, Flown, started, Slated, suited, traced, Arisen, diffused, Resulted, agreed, Targeted, Housed, addicted, poised, dropped, gone, Stepped, Waged, Logged, wrapped, ridden, bound, priced, driven, forged, Brought, cast, Borne, drawn, Carried, affixed, loaded, Fought, ranked, hooked, filled, capped, headed, placed, seated, tied, fired, linked, Pegged, checked, fixed, focussed, applied, aired, Shifted, powered, raised, led, perched, effected, clipped, desired, sorted, packed, Shipped, taken, Asked, Caused, kicked, Cared, kept, cut, done, based, Gotten, Got, dated, made, Installed, Fitted, assembled. unmounted, unaffixed, undecorated, loose, unadorned. She went to El Rey and mounted. Big Bill had mounted and was riding away, his eyes on the ground, refusing to follow the figure of a man he had come to hate most thoroughly. meat, menotti, metadata, mod, mantidae, moot, matey, mentha, monod, montia, mit, mode, midway, manteidae, minded, minuet, maundy, manumit, mut, mend, Mothy, muted, meted out, moody, myth, meditate, minuend, moment, Mahdi, mayweed, mint, manned, mind, mid, month, muddied, mott, manhood, meadow, minute, math, mound, meed, midi, may day, mayday, made, Mete, mouth, med, mat, muhammad, meade, memento, Mohammad, monday, manda, maid, muddy, mined, mot, mountie, mate, mt, meth, maund, motto, mediety, monnet, monody, mammutidae, midday, mute, madia, meaty, mantua, moat, myoid, mote, manta, mohammed, manat, mite, mahout, manatee, mennonite, mammoth, mad, mediate, mandate, momot, matted, manteodea, mimidae, mated, mediated, mantid, matt, maidhood, monied, minuit, momotidae, mammut, minnewit, mete out, maidu, manhunt, mande, moth, method, man-made, manet, manihot, maimed, manidae, monad, mutate, middy, mood, mahomet, monument, mitt, monet, mud, Mutawa, mount, munda, mead, moated, matai, moneyed, miniate, matthew, mahound, mutt, minutia, meet, motet, monte, matte, md, medea, mamet, maenad, moiety, MDI.